Israel’s war on Palestinian media – Why no protest from the UK government? In March 2016, Israel continued its assault on Palestinian media organisations by closing down the TV station, Palestine Today, and arresting some of its staff. The British government, so vocal at other times in its defence of ‘democratic values’, responded only with silence. The APUK collective sent this letter to the Foreign Secretary, Philip Hammond, to request that he apply the principles that apparently underpin his government’s domestic policy, to relations with Britain’s allies overseas. We await a reply. 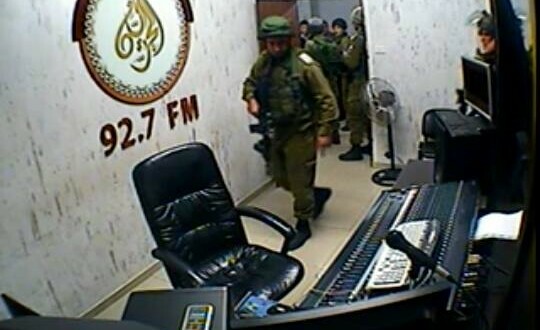 Israeli troops invading Palestinian radio station. Picture:Palestine News Network. As the Freedom Theatre’s first ever UK tour draws to a close, we are proud to be able to post a short film (27 minutes) offering insights into the experience of members of the company, and also the audiences who have flocked to see The Siege at 10 venues from Manchester to Hastings, Colchester to Glasgow, where the tour ends on June 20. The play tells the story of a group of armed men who sought sanctuary in arguably the world’s holiest site, the Church of the Holy Nativity, in Bethlehem in 2002. Based in Jenin refugee camp in the West Bank, Freedom Theatre rose out of the resistance to Israeli occupation, survived the brutal killing of its founder Juliano Mer Khamis, and continues to exemplify Palestinian cultural resistance in the face of intimidation and harrassment, which even followed it to the UK. In May 2002, Alrowwad theatre centre was vandalised by the Israeli army. They broke our video cameras and computers, and emptied oil and acrylic painting tubes all over the space. During our tours in the West Bank, many checkpoints forbid us passage with our theatre or dance shows and our play bus. We wait for hours, sometimes without being allowed to pass south to Hebron or to the north. No access is granted to Gaza, to East Jerusalem or 1948 Palestine. I went to Palestine on Saturday 7th February and came back on Sunday 15th February. I failed to get into Gaza to pursue the work on War and Peace.